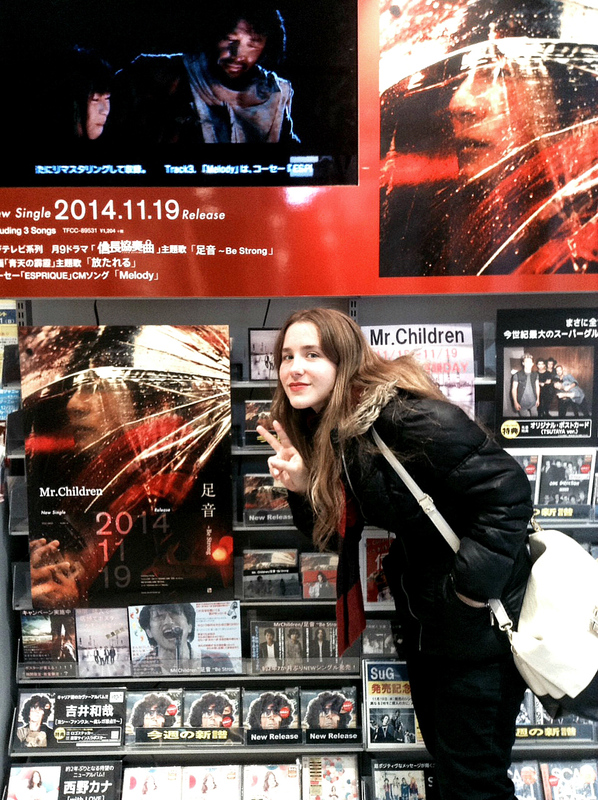 Rock act Mr. Children’s newly released single “Ashioto — Be Strong” (“Footsteps, Be Strong”) has attracted a lot of attention. This is par for the course with a Mr. Children song, but it’s also the opening track for the ongoing Fuji TV drama series “Nobunaga Concerto,” which features stars such as Shun Oguri. The artwork for the single was done by Reylia Slaby—an American national born and raised in Japan. Originally a graphite pencil artist, she moved onto photography as she felt it was a better medium to express her view of the world. Her dream-like images caught the attention of one of the biggest bands in Japan and are now seen plastered across billboards and stores nationwide. I spent some time emailing different art websites and blogs asking them to showcase my work. A few of them did, but one in particular went kind of viral (Artist Database). After that, Kenji Tomonaga (executive director of the creative division at Mr. Children’s record label, Toy’s Factory) got in touch and asked me to work with him. At first, one of my friends was a bit skeptical, saying maybe it was a scam! After all, how could Mr. Children just be emailing me out of nowhere!? He contacted me in July, and by August we were already shooting photos for the CD, which was released Nov. 19. It was all very fast! I shot the cover photo and designed the whole CD booklet, which included an acrylic panel on the back cover, as well the band’s new artist photo. They kept me very busy. Is there a theme behind the cover image? I received a sample CD to listen to before going to Tokyo to present my ideas to the label people and the band. Though the three songs on the single — “Ashioto — Be Strong,” “Hanatareru” (“Released”) and “Melody” — are quite different, the lyrics have one main thread of “starting anew” and “keeping going,” which I can really relate to. I presented two concepts — one red and one blue. The red one is the cover image with the umbrella, and the blue one, with butterflies, is inside the CD booklet. I’m very happy we managed to incorporate both ideas. At the meeting, the (band) members were very quiet, but they seemed to trust the label’s judgment and the whole process went very smoothly. Is there any meaning behind the umbrella? The transparent umbrella was actually brought up by the label, after having seen a similar piece online that I’d done. That piece is about when you are hurt, showing your pain, but the umbrella shields you from full exposure. It’s just a guess, but since the band is so famous and the members have been in the spotlight for so long, (I think) they also keep a barrier between them and others—they can’t share all of themselves with everyone. What was it like to work with the band members? Both the members and staff were amazing to work with! They were very kind, professional, humble and relaxed. The umbrella photo was taken at a shrine in Tokyo and we were done in just about an hour. I normally work in a more intimate setting of two to four people, so having 10 to 15 label staff on set with me over two days was definitely an interesting contrast! Also, I tend to work with female models as they are often more expressive, but lead singer Kazutoshi Sakurai (pictured on the cover image) has very emotive features and was incredibly easy to work with. He’s been doing this for a long time, so it’s not surprising! 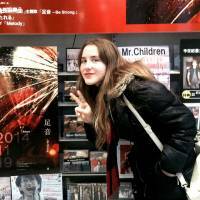 Reylia Slaby will be exhibiting her work, including a framed photograph of the Mr. Children CD cover, at Irie Taikichi Memorial Museum of Photography Nara City on Dec. 21. (10:30 a.m.-4:30 p.m.; admission is free). For more information, visit www.reyliaslaby.com.